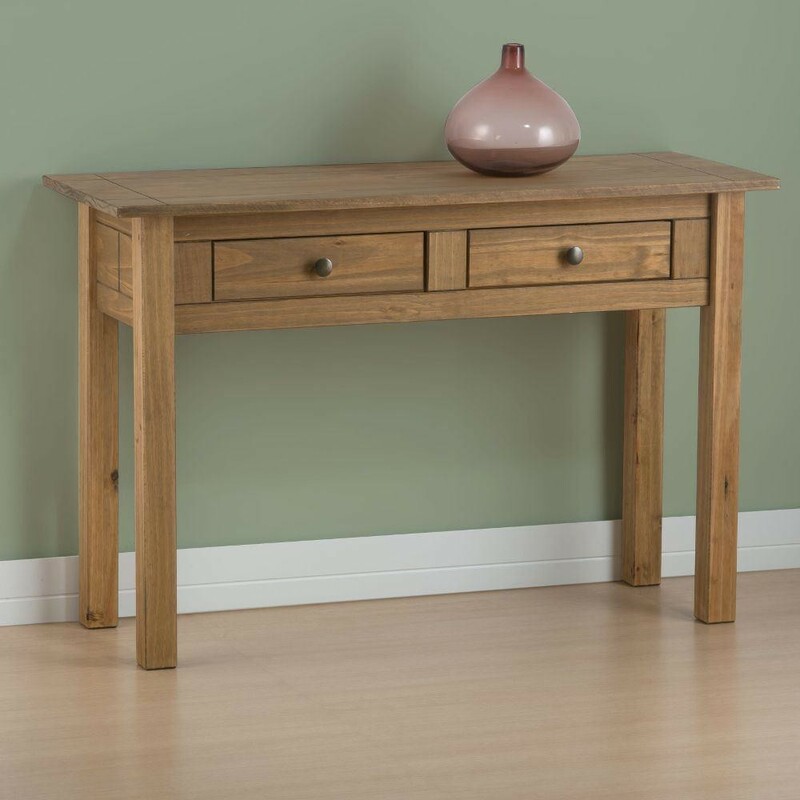 The Santiago 2 Drawer Console Table is a warm and homely piece of furniture that will compliment any space. The rustic feel of the wood, combined with the classic design, results in a console table that is handsome and practical. The table has 2 small drawers and a useful surface area for displaying your lamps, frames and other belongings. Only quality materials have been used in the creation of the Santiago 2 Drawer Console Table. The strength of the piece comes from the brilliant design and the solid pine that is used in the frame. The table features attractive zinc alloy handles to contrast against the natural pine. The pine has been given a distress treatment to help age the piece and add to the rustic vibe of the piece. The Santiago 2 Drawer Console Table is a classic design with many practical applications. Use the Santiago 2 Drawer Console Table in the dining room to showcase photo frames, store essentials or display your favourite collectables. Place the Santiago 2 Drawer Console Table in the hallway as the perfect place to unload your pockets when walking through the door. There are plenty of options thanks to the timeless design of the console table. The Santiago 2 Drawer Console Table is a beautiful and practical piece of furniture that brings rustic charm into the home. The 2 drawers provide a small amount of storage and the surface is useful for displaying your belongings in style. The Santiago 2 Drawer Console Table has a simple design, ensuring it will work and evolve in your home over time. The Santiago 2 Drawer Console Table is part of our Santiago collection, use as a standalone piece or mix and match with other items from the collection. The Santiago Pine 2 Drawer Console Table is part of the Santiago Pine Wooden Bedroom Furniture Collection.